Kuala Lumpur International Airport (KLIA) serves as the main gateway to Malaysia and the region. Over 60 international airlines, including low cost carriers provide direct access from more than 100 destinations worldwide via KLIA, Penang, Langkawi, Kota Kinabalu and Kuching international airports. Amongst these is the country’s national carrier, Malaysia Airlines (MAS). In addition, the Kuala Lumpur International Airport 2 (KLIA2) is able to cater to 45 million passengers a year, providing greater accessibility. Air travel is further supported by 16 domestic airports. The KLIA Ekspres and KLIA Transit trains (also known as Ekspres Rail Link or ERL) are high-speed trains that connect the airport to KL Sentral Station in the city. KLIA Ekspres is the fastest mode of transport to the airport. The journey to KLIA takes 28 minutes while the journey to KLIA 2 takes 33 minutes. KLIA Transit is a similar high-speed train, but has four stops along the way; at Bandar Tasik Selatan, Salak Tinggi, Putrajaya/Cyberjaya and KLIA. The entire journey to KLIA 2 by KLIA Transit takes only 38 minutes. During the congress, all delegates will receive a 20% discount on ERL tickets from KLIA and KLIA 2 to the KL Sentral. 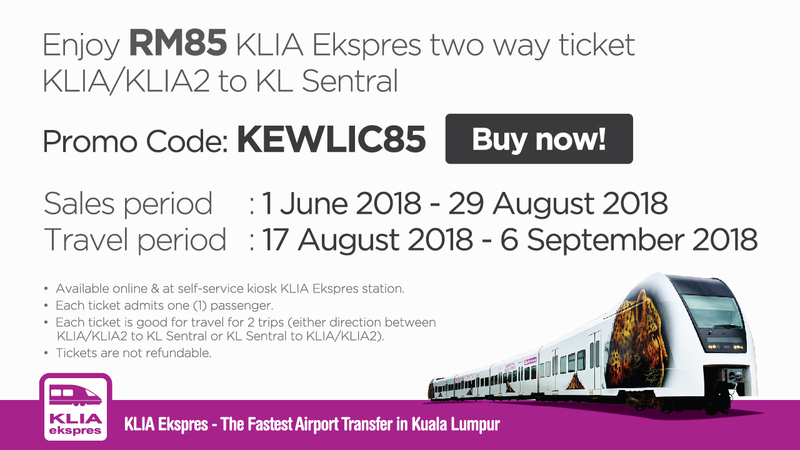 KLIA Ekspres tickets can be purchased on www.KLIAekspres.com/Buy-ticket with the promo code KEWLIC85. Delegates can print the train ticket and scan it at the access gate at the KLIA Ekspres train station in KL International airport or KL Sentral in the city. Please note that the discount is not applicable for the KLIA Transit train. These are scheduled air-conditioned buses that provide transport between the airport and the city. Tickets can be purchased at the counters or onboard the bus. Skybus tickets can also be purchased onboard AirAsia flights or online when purchasing AirAsia flight tickets. KLIA Airport Limo offers pick-up and transfer services using a prepaid coupon system. Travel time to the city takes between 45 minutes to an hour. Fares differ according to the zone and type of taxi (budget or premier). A surcharge will be imposed for transfers between midnight to 06:00. The Airport Coach provides scheduled bus services from KLIA to KL Sentral Station. The bus station is situated at the Ground Floor, Block C of KLIA’s Main Terminal. The journey takes about 1 ½ hours, depending on traffic. The main bus terminals in Kuala Lumpur are Pudu Sentral, TBSBTS (Bandar Tasik Selatan Integrated South Terminal) and Hentian Putra. Visitors from the north (states such as Penang, Perak, Cameron Highlands, Genting Highlands and southern Thailand) will arrive in Pudu Sentral. The hub for buses from the south (Melaka, Johor and Singapore) is TBSBTS. Hentian Putra is the disembarkation point for buses from the east coast states of Pahang, Kelantan and Terengganu. Generally banking hours in Malaysia are from 9:30-16:30 (Mondays – Fridays), although some banks do extend their banking hours. Automated Teller Machines (ATM) are available at convenient locations throughout the country. All the main credit cards and traveler‘s cheques are accepted in major institutions and an ever-growing number of shops and restaurants. Malaysia enjoys a tropical climate with warm weather all year round. Temperatures range from low of 21°C (70°F) to high of 32°C (90°F). The highlands are cooler with temperatures ranging from 15°C (59° F) to 25°C (77°F). Annual rainfall varies from 2,000mm to 2,500mm. KL’s long and colorful history has left a legacy of heritage sites which bear the stamp of various for-eign influences. The main heritage zones in the city are Merdeka Square, Market Square, Chinatown (Petaing Street) and Jalan Tuanku Abdul Rahman, as one of the leading shopping hubs in the region. Browse through the swanky malls, high-end boutiques, duty free outlets and bustling street bazaars for a range of irresistible goods. KL’s nightlife is as vivid and diverse as its cultural attractions. Chic bistros and watering holes offer a wide spectrum of styles and settings for the party crowd to chill out. Take your pick from the night spots that belt out Latin, techno, R&B, reggae, retro or groovy tunes and beats. The currency in Malaysia is Malaysian Ringgit, indicated as ‚MYR‘. Visit www.xe.com for the latest exchange rates. Foreign Exchange Booths are common and clearly state the exchange rate for all major currencies. Automated Teller Machines (ATMs) are located at major bank branches, most shopping malls, airports, bus terminals, etc. Note that ATMs in Malaysia require a six-digit PIN. Please be advised that if your ATM PIN is more or less than six digits, it should be changed before departing. Voltage is 230 – 240 volts AC at 50hz cycles per second. The standard is 3-pin square plugs and sockets. Malaysia’s international calling code is +60. Kuala Lumpur is hailed as the region’s food capital for its delectable of mouth-watering delights. Major hotels and shopping malls are decked with gourmet restaurants, coffee houses, delicatessens and also alfresco cafes. A number of exclusive restaurants offer traditional performance for visitors to get a glimpse of local culture. Like in other cities, designer coffee shops with Wi-Fi facilities are a popular hangout at any time of the day. Bukit Bintang and Jalan Tun Ismail are lined with trendy sidewalk cafes that are great spots for people-watching and chilling out. As a cosmopolitan city, Kuala Lumpur offers a number of restaurants that serve international fare. Continental food, fusion food as well as Mediterranean, Korean, Thai, Japanese, Indonesian, Middle East, Italian and French Cuisine can be savored during a visit here. Authentic Malaysian fare which consists of Malay, Chinese and Indian food is worth trying out. For a novel experience, try the local hawker-style fare at open-air food courts where dishes are freshly prepared upon order. A number of restaurants are open 24 hours so anytime is a good time for a snack. Muslims can rest assured that halal food is easily available. To savor local delights, visit places like Jalan Alor (Chinese food), Kampong Baharu (Malay food), and Little India (Indian food). So, come with a big appetite and enjoy a gastronomic adventure in Kuala Lumpur! The sun is strong throughout the year in the country. Proper care against sunburn must be constantly taken. Dehydration and loss of salt through perspiration are two other common problems for the unprepared traveller. Drink plenty of fluids and replace your salt loss and remember that alcoholic drinks make dehydration worse, not better. Make sure you pack clothing suitable for a warm humid climate. Due to the constant humid climate, mosquitoes tend to be present throughout the year. The three most significant diseases transmitted by mosquitoes are Malaria, Dengue Fever and Japanese B Encephalitis. To repel mosquitoes, ticks and other arthropods, apply an insect repellent containing DEET to your skin or clothing. The risk of malaria for most tourists visiting Peninsular Malaysia is extremely small. There is insignificant risk in Kuala Lumpur, Penang and other major cities. However, in East Malaysia, the risk of malaria is present throughout the year. Even in these regions, the risk is mainly off the coastal plains and towards the border areas. Generally, prophylaxis is recommended for those visiting Sabah or Sarawak. Generally, the level of food hygiene throughout the country is high. However, make sure your food and drinking water are safe. Food from street vendors should be treated with care. Drink only bottled or boiled water, or carbonated (bubbly) drinks in cans or bottles. If possible, avoid tap water, fountain drinks, and ice cubes. Recommended vaccines: Poliomyelitis (childhood booster), Tetanus (childhood booster), Typhoid (food & water borne diseases), Hepatitis A (food & water borne diseases). For those venturing outside cities and towns, further recommended vaccines are Hepatitis B, Rabies, Japanese B Encephalitis, Tuberculosis and Meningitis. For those visiting Sabah and Sarawak, Malaria prophylaxis is strongly recommended. If you are coming from, or have recently travelled in, South America or sub-Saharan Africa you must present a certificate of vaccination against Yellow Fever upon arrival in Malaysia. Clinics and dispensaries take care of non-major medical treatment while state-run hospitals are available in all major towns. Be sure to have the appropriate travel health insurance. Malaysia is generally a laid back and relaxed place. However, it does have its own customs and visitors should try to observe these practices when they arrive. Some common courtesies and customs are as follows: Although handshakes are generally acceptable for both men and women, some Muslim ladies may acknowledge introductions to gentlemen by merely nodding and smiling. Informal dressing (e.g. lightweight linens & cottons, T-shirt, shorts, jeans) is generally acceptable. For dinners and night spots, smart casual wear is the norm. When entering mosques and temples, wear long sleeves and loose trousers or long skirts as a sign of respect. The right forefinger is not used to point at places, objects or persons. Instead, the thumb of the right hand with four fingers folded under is the preferred usage. Shoes must be removed when entering places of worship such as mosques and temples. Some mosques provide robes and scarves for female visitors. Taking photographs at places of worship is usually permitted but always ask permission beforehand. Peninsula Malaysia transport network is diverse with extensive roadways stretching over 63,445km, including 1,630km of expressways. Its main highway extends over 800km, from the Thai border all the way to Singapore. Taxi Services are the most widely and easily available form of transport. City taxies operate by meter and may be hired from taxi stands, hailed by roadside or through a radiophone paging system. There are also minivan-type taxis for carrying larger parties. Light Rail Transit (LRT) and KL Monorail provide inner-city public transportation for Kuala Lumpur, serving businesses, hotels and shopping districts, and also major parts of greater Kuala Lumpur. Fares are more affordable than taxis and will link-up with other LRT and train networks at KL Sentral. East Malaysia (Sabah and Sarawak) is well-connected to Peninsula Malaysia via frequent flights to various cities. Flights are provided by Malaysia Airlines (MAS), AirAsia and Firefly. MAS operates flights from several countries to major airports in East Malaysia, including Kuching International Airport (Sarawak) and Kota Kinabalu International Airport (Sabah). Public transport (buses and taxis), charter and rental services are also conveniently available in Sabah and Sarawak. The Pan Borneo Highway connects Sabah and Sarawak as well as Brunei. This is issued to foreign nationals who require a visa to enter Malaysia mainly for social visit. It is normally valid for a single entry and for a period of three months from the date of issue. This is issued to foreign nationals who require a visa to enter Malaysia mainly for business or government-to-government matters. It is normally valid for a period within three months to twelve months from the date of issue. Citizens of India and the People‘s Republic of China who wish to enter Malaysia for the purpose of a Social Visit are eligible to apply for the Multiple Entry Visa. The validity of the Multiple Entry Visa is one year. Each entry is for 30 days only and an extension of stay is not allowed. This is issued to foreign nationals who require a visa to enter Malaysia mainly on transit to other countries. Foreign nationals on transit without leaving the airport premises and who continue their journey to the next destination with the same flight do not require a transit visa. Visa applications must be made at any nearest Malaysian Representative Foreign Office. • Visa is not required for stay less than one month for ASEAN nationals except Myanmar. A visa is required for the duration of stay that exceeds one month except for Brunei and Singapore nationals. • For nationals of Israel who wish to enter, they will require a visa and approval must be granted from Ministry of Home Affairs, Malaysia. For more information visit Immigration Department of Malaysia http://www.imi.gov.my/index.php/en/. Opens from 08:30 to 17:00 daily, except on the first Saturday of each month, Sundays and public holidays. In Kelantan and Terengganu post offices operate during the same time, but are closed on Fridays and public holidays. Kuala Lumpur is a paradise for shoppers with something to cater to every taste and budget. There are numbers of a swanky malls that offer internationally-known brands. Most of these malls serve lifestyle centers and come complete with restaurants, cineplexes, spas, fitness centers and theme parks. Bukit Bintang is undoubtedly the city’s foremost shopping district with everything from haute couture fashion, fragrances and timepieces to computer peripherals and latest gadgets. More chic shopping malls are located at KLCC and Jalan Ampang. Sub-urban enclaves such as Bangsar are known for their exclusive boutiques and a range of specialty shops. Visitors in search of novelty items will be spoilt for choice at the open air bazaars where bargain hunting is the order of the day. The casual street shops at Jalan Tunku Abdul Rahman and Petaling Street stack every imaginable item from crafts to belts, bags and electronic goods. Ethnic-style crafts, accessories and traditional Indian attire can be found at the Little India enclave in Brickfields. Most retail shops and shopping centers in KL operate from 10:00 to 22:00. Government offices operate from 08:00 to 17:00 on weekdays only. On the contrary, KL is famous for its round-the-clock eating time; you‘ll see many eateries open for 24 hours a day, 7 days a week. Local calls can be made from public phones using coins or pre-paid cards. International calls can be made from public phones with card phone facilities or at any Telekom office. Most hotels and restaurants levy a 10% service charge and 6% Goods and Service Tax (GST) on bills. Therefore, tipping is not customary. However, should you want to show your appreciation for good services, a small tip will do.